If you live close to a transit station, chances are you’ve weathered the recession better than your friends who don’t. Your transportation costs are probably lower, since you can take transit instead of driving. Transit-served areas are usually more walkable and bikeable too, multiplying your options. And while home values plummeted during a recession that was triggered by a massive housing bubble, your home probably held its value relatively well – if you live near transit. The National Association of Realtors and the American Public Transportation Association commissioned the Center for Neighborhood Technology to study the impact of transit access on home values during the recession. For the report, “The New Real Estate Mantra: Location Near Public Transportation” [PDF], CNT looked at five metro regions — Boston, Chicago, Minneapolis-St. Paul, Phoenix, and San Francisco. Across the study regions, the transit shed outperformed the region as a whole by 41.6 percent. 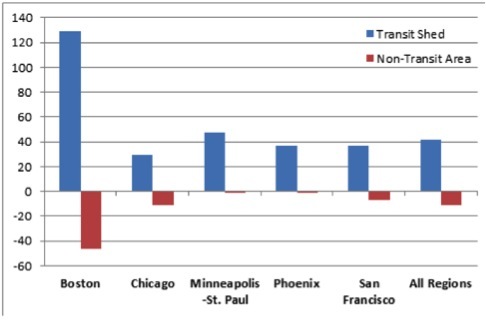 In all of the regions the drop in average residential sales prices within the transit shed was smaller than in the region as a whole or the non-transit area. Boston station areas outperformed the region the most (129 percent), followed by Minneapolis-St. Paul (48 percent), San Francisco and Phoenix (37 percent), and Chicago (30 percent). This is consistent with a study released last year by the Center for Housing Policy showing that access to rail transit created a “transit premium” for nearby home values of between six and 50 percent. That study, like CNT’s, looked at Minneapolis and Chicago, as well as Portland. The Center for Transit Oriented Development has also looked at this phenomenon and found transit premiums as high as 150 percent. Not surprisingly, not all transit types fared the same in CNT’s research. Stations with frequent service that are part of a well-connected transit network gave the biggest boost to home values. Those households, naturally, have better access to jobs and lower transportation costs. Additionally, there’s variation because different types of transit serve different types of neighborhoods. Commuter rail station neighborhoods tend not to be as walkable and compact as those served by high-frequency, well-connected transit like subways, light rail, or BRT — and one WalkScore point reportedly worth an additional $3,000 in a home’s value. In examining office rents in walkable and non-walkable areas, real estate developer Chris Leinberger attributed two-thirds of the walkable areas’ better performance to walkability. Phoenix is not known for being a transit-rich city. Indeed, only 2 percent of the region’s households live within a half-mile walk of a Metro station. Even within the transit shed, just 9.1 percent of workers commute via transit. Still, even a relatively weak transit system showed substantial benefits for nearby homeowners: Their home values outperformed the area by 36.8 percent, with apartments faring the best. 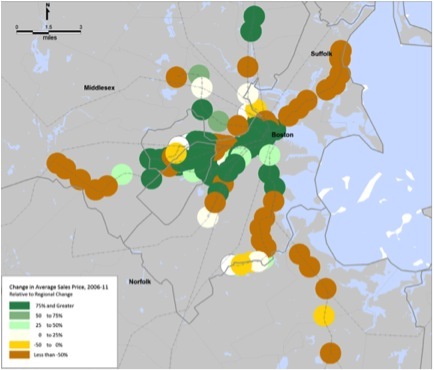 Apartment living also paid off in Boston, a far more transit-rich city, where a third of workers with transit access use it to get to work – and more than half of transit-served residents commuting via transit, biking, or walking. Those folks didn’t just save on transportation – their home values fared 226.7 percent better than the region as whole if they were served by rapid transit. Homes served by commuter rail actually declined even more than the regional average, even in relatively close-in areas. As in Phoenix, apartments lost the least value. In Chicago, home prices dropped by nearly a third between 2006 and 2011, but if you lived near transit, your home lost almost 30 percent less value than the region at large – especially if you lived near the L, in which case you did 47.3 percent better. Commuter rail-served areas got a somewhat smaller boost at 22.7 percent. In Chicago, it was townhouses, not apartments, that saw the smallest decline. San Francisco has the most widely-used transit service of any of the study areas, with 40 percent of workers with transit access riding it to get to work and another 21 percent walking or biking. San Francisco’s housing prices were among the hardest hit of the five regions, but those served by Muni outperformed the rest of the region by 61.6 percent. BART access added only about 35 percent, with transit access in general helping boost home values, relative to the region as a whole, by 37.2 percent. Just to be clear, what they are defining as “transit” is fixed-guideway systems of some sort–light rail, heavy rail or BRT. (Even cable cars! Which is not entirely fair because in San Francisco cable cars are so expensive, only tourists take them.) So regular buses wouldn’t count. And they defined a transit shed as being within a half mile (a ten minute walk) of a fixed-guideway system stop. The charts seem to show that not only if you lived in a transit shed (as they define it) your housing values did better and transportation costs were lower, but the nearer you were to where jobs were located, the more housing values held. So the far outer suburbs that had access to transit did not do nearly as well as the inner cities. Even the outer neighborhoods of San Francisco did not do as well as those near the downtown core. Walkability of the inner neighborhoods versus outer neighborhoods/suburbs may indeed impact this, (people enjoy living in lively, active places!) but also perhaps just sheer commute time? Yikes! This is a shocking statistic, since commuter rail is supposedly a huge selling point in metropolitan areas that have it. Does this mean we should be converting our commuter rail frequent service like Paris RER systems? Boston’s commuter rail is not as great as New York’s; wish this could be corroborated with NY data. Housing near transit is still insanely unaffordable even after a badly needed correction? Awesome! What a win for liveable streets! If this is correct, then we don’t need any TIF, TOD or any other taxpayer subsidizes around transit right? …which, of course, presumes that “you” currently own a house near transi, and have owned it for a while. This is indisputably good news for people in that small subset of the population–a subset that, simply by virtue of owning extremely expensive real estate, is probably well accustomed to hearing good news. It’s terrible economic news for everybody else who might want to live near transit though, and the writer of the article seems either blissfully unaware of that or oddly unconcerned by it. I agree wholeheartedly. Besides real estate speculators, the only ones who benefit from high housing prices are those who bought their home a long time ago, and are looking to sell it now. Those who intend to stay don’t benefit. Those who are looking to buy certainly don’t benefit. The hard fact is there is a huge shortage of urban housing stock but no incentives to build more. After all, those who own real estate benefit by the status quo of ever higher prices. Why should they build more housing when it’ll only hurt them? The only answer I’m seeing is governments building large amounts of housing so as to drive down real estate prices. That won’t happen either thanks to the influence of the NAR. Things will only change when you have such a massive influx of suburban residents who can no longer find jobs that we have no choice. Er, isn’t that the whole point of the article? That the transit networks should be extended to serve more people and more areas? This is a shocking statistic, since commuter rail is supposedly a huge selling point in metropolitan areas that have it. It is? I mean, surely it’s better than having nothing at all, but classic American-style commuter rail (huge station spacing, horrible frequency, and short operating hours) is a fairly awful solution for everyday travel needs. Just to reinforce Miles Bader’s point below. The fact that people now want to live near fixed rail is a good thing. What if the opposite were true, and people were still fleeing cities for far-flung, auto-dependent suburbs? The answer is not only to continue to build density near existing rail stops, but also to extend transit where it makes sense so that, eventually, most Americans are living within two miles of some sort of an electrified rail transit stop. Having the data that housing values will increase (or at least fare far better) if that transit is there than if nothing is done is a great way to convince current homeowners that they should be willing to tax themselves so that this can happen. Two examples in areas I know well having living in them–urban San Francisco and suburbs of Seattle. In San Francisco there is now a housing boom on the east side of the city. Within a mile and half of me on Market Street there are six huge projects going in that will have retail on the ground floor and 40 – 100 units of housing above. Same is going on in many of the eastern neighborhoods where you can walk to transit, shops and restaurants. Many of the projects had been planned but were put on hold during the 2008 financial crash. It was only when the developers had confidence that condo values in San Francisco were strong enough to recover their investment that the projects went forward. (My only hope is that most people living in these massive new buildings will be willing to forgo cars because there just isn’t room on the streets for all these people to drive even if they all have a parking space at their new condo.) Even more interesting, most of these new housing projects are taking the place of former automotive infrastructure–former car dealerships, former freeways, former gas stations, former parking lots. This is all a good thing. Will it reduce rents in San Francisco? Not a chance. Basically nothing reduces rents in San Francisco except recessions. This current bubble will end, too, rents and housing will drop again, but 10,000 more units of housing will have been built precisely because people now want to live in walkable, transit-rich neighborhoods, keeping prices high in those neighborhoods. In contrast, the suburbs carved out of farmland the last couple decades with subsidized 60 mile commutes are doing poorly. For all sorts of reasons, they never should have been built but were because people valued 5000 sq ft houses more than living near transit. Interestingly Habitat has just finished a 36 unit condo project in Daly City within walking distance of BART. Even they are figuring out that transit access and density is the way to go in large cities. The desirability of living near transit is what will eventually convince San Mateo and Santa Clara counties to extend BART southwards on the SF penninsula, perhaps (I hope) straight down El Camino, providing all sorts of opportunities for TOD. If, however, homeowners fight it, it will not happen. In the suburbs of Seattle where I grew up and where most of my family lives, traffic is a nightmare, but the only member of my extended family who takes transit is my sister (who, coincidentally lived in San Francisco for 7 years.) She drives to a park and ride and takes an express bus into downtown. There is no fixed rail to the northern suburbs where they live because homeowners like themselves repeatedly voted down any form of taxation to pay for it for more than 30 years. Now Seattle has a single rail line from the airport to downtown and work is underway to slowly build out this line to link other Seattle neighborhoods. If they are lucky, this single line may reach the suburbs where my family lives in another *ten* years. Even then, none of them will be within 2 miles of a proposed stop. Even now, funding is still in question. Even then, they will prefer their cars (if indeed there is still gasoline available at the time) because they consider transit to be for poor people who can’t afford cars. Since they can’t imagine using transit themselves, the argument that available transit increases rather than decreases their housing values would be about the only way to garner their support. Part of the point is that this price signal will prompt developers to build more units (housing and commercial) near transit. All other costs the same, they can charge more money for their units that are near useful transit. In an ideal situation the policy would be put in place to up-zone parcels within the walk shed of the best transit service, the service could be made more frequent due to increased demand, and more units would be available to people who wanted to live close to transit. Those who want or need to use there cars frequently could move into units farther from transit. The Government does not need to build lots of units, they just need to facilitate the development of higher density near transit. Instead of protecting the low rise, low intensity development that often occupies premium locations that are well served by existing transit. That’s interesting, I thought transport actually hurt property value. That’s the case with old style train stations and with airports.